As I scrubbed the inside of my microwave this weekend, I contemplated the idea that people without children must, as a whole, live longer than those who have chosen (for whatever insane reason) to procreate. I am convinced that the daily surges of electricity that I get when momentarily aggravated by something the children have done, are actually moments of my life leaving my body every single day. My daughter is in the “science experiment” phase of her childhood right now. While I do appreciate the fact that she wants to be creative, I wish she wasn’t so damn sneaky with her “creativity”. I’m pretty sure the cosmos are now punishing me for all the walls my son DIDN’T scribble on, all the worms he DIDN’T dissect, all the raisins he could have shoved up his nose but DIDN’T, and all the times he could have glued his eyeballs open and chose NOT to be an idiot. Because he never did anything weird with duct tape or rubber cement, he created naive parents in us. We were naive because we had the impression that children ages 6-9 were actually manageable and could be left alone in a room while one used the bathroom or cooked dinner. Or left alone with a younger child. Or a pet. Or a rock. At this point in time, I was scrubbing the microwave not because I was bored or didn’t have anything else to do. I was ferociously cleaning it because my darling child had decided to melt crayons in said microwave. 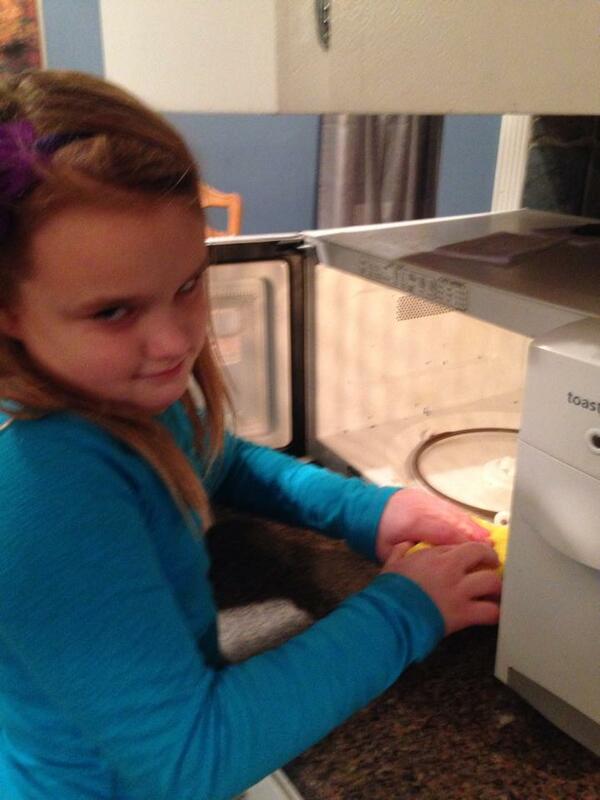 In case you are wondering, crayons apparently explode in the microwave. 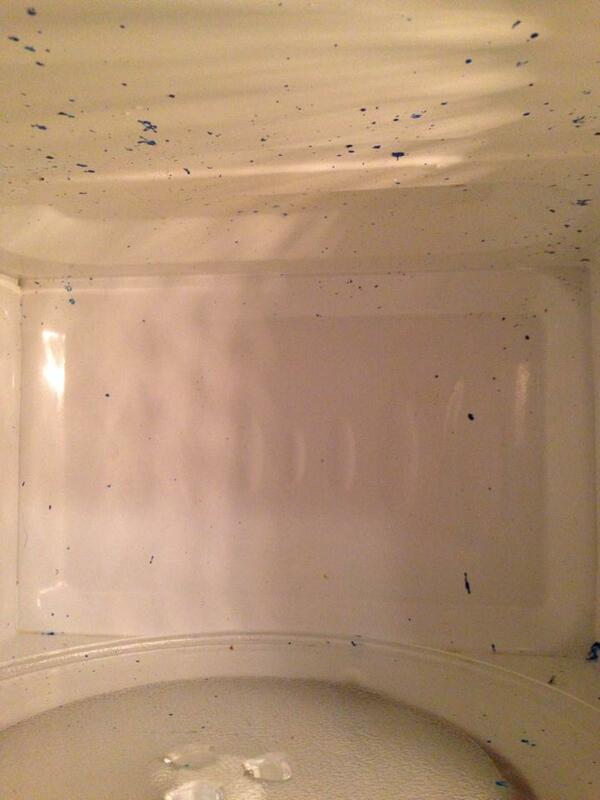 At least that is the impression that I get from the flecks of blue that now coat my microwave. I’m not sure if she reached the same hypothesis as a result of her experiment. I didn’t ask. I was too busy trying to calm the heart palpitations. What is even more annoying is that this “experiment” unfortunately followed directly on the heels of the “Great Lip Balm Debacle of 2015”. A few days prior, I went into the freezer to get the meat to defrost, only to find a hardened green rubbery mess all over the ice tray. It looked like ice cream, but I knew better. I sniffed it with caution and based on its flowery scent, I determined that it was either hand lotion or shampoo. Either way, it doesn’t belong in my freezer. Still, I am glad it wasn’t as messy as the time she and her little 4 year old friend put cans of Pepsi in the freezer to see what happened. I’m STILL scraping frozen soda off the side of the freezer and actually used the word SHRAPNEL when describing the scene to my husband. I blow out a puff of irritated air and promptly call my resident Doc Brown to appear before me in the kitchen. “What’s this?” I ask pointing at the green crap. “I don’t know,” she replies with all the shoulder shrugs and innocence that she could muster. Just then, the older child wanders in. He stares at me for a minute, his brow furrowing. “What’s hand lotion?” he asks in all seriousness. I smirk as I send him on his way. “Nope! Not him,” I announce. I can see the wheels turning in her head as she scrambles to come up with another scapegoat. The dog scrambles away. He’s not getting blamed. He doesn’t even have opposable thumbs. “It musta been Daddy!” She finally decides. After some well placed stares and threats to her TV viewing, she finally comes clean. Apparently she was watching some You Tube video on how to make your own lip balm. Add her reason for wanting to make her own lip balm??? Oh yeah, she wanted to SAVE ME MONEY! Yes, the same kid who practically throws herself on the floor in Old Navy because I won’t buy her the useless crap that they line the checkout line with, like a snowman keychain (when she doesn’t even have keys) and a coloring book (when she doesn’t even color). She wanted to save me money…a likely story. The more likely story is that she saw the You Tube video and said, YES! I must do that even though it makes absolutely no sense whatsoever! I must wait until my mother takes the garbage out or tries to fold laundry because she will definitely try to stop me and I cannot imagine WHY she wouldn’t want me to make my own lip balm! Which is why I am now taking away her iPad and blocking You Tube from ever being streamed into my house again. And pronto, before she gets an idea to make a volcano out of mashed potatoes and red jello.